High-Quality Graco Lubrication Pumps, Meters, Valves, Hose Reels, and Accessories. Increase Productivity and Reduce Waste and Downtime. 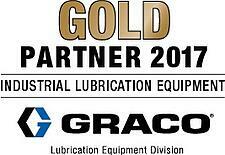 LubriSource forms valuable relationships with reliable, well-known lubrication equipment providers like Graco. Our clients benefit from tapping into the power of the latest technological advancements and receiving the highest-quality lubrication products from the best companies in the industry. At the heart of every reliable, productive, and cost-effective lubrication system lies superior practices in accurately measuring and dispensing lubricants. Graco is a recognized and trusted name in the lubrication industry with expertise in dispensing lubricants in industrial and commercial applications. Do you need help installing, servicing your lubrication systems? Are you in need of an automatic lubrication systems for your plant? Looking for ways to avoid contamination during fluid transfer? Our lubrication technicians are at your side to deliver superb Graco lubrication systems and equipment. LubriSource technicians are trained and experienced in effectively using Graco's products and solutions. Our technicians can customize lubrication solutions for an entire facility, a single area's automatic lubrication system, or an individual lubrication point. Regardless of the project's size, we do whatever it takes to bring you improved operations and higher returns on your investments. Contact a knowledgeable LubriSource representative to get started working with Graco's lubrication equipment and products today.